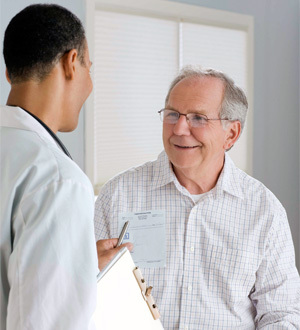 The 4Kscore Test is recommended for men concerned with their risk for high-grade, aggressive prostate cancer and is especially useful when considering a prostate biopsy. The 4Kscore Test measures four biomarkers: total PSA, free PSA, intact PSA, and hK2. Blood test results are combined in an algorithm with a patient’s age, optional digital rectal exam, and prior biopsy results to give physicians a personal risk score for each patient. Unlike traditional PSA tests, 4Kscore distinguishes men with a low risk for aggressive prostate cancer from those with a high risk. Men with a low-risk 4Kscore have a more than 99 percent chance of not developing distant metastasis within the next 10 years. Physicians can identify patients with a high probability of having aggressive prostate cancer and offer appropriate treatment, while avoiding overtreatment of low-grade prostate cancer. While the 4Kscore Test can’t provide a prostate cancer diagnosis, it can help physicians and their patients decide whether or not to perform a biopsy based on the probability of the patient having potentially life-threatening prostate cancer. For more information about prostate cancer, visit the American Cancer Society prostate cancer page. Prostate cancer affects only men. About 6 in 10 cases are in men age 65 or older. More than 200,000 men in the U.S. are diagnosed with prostate cancer every year. It is the second most common cancer among men in the U.S. (after skin cancer). Prostate cancer often has no early symptoms.